So, you club is organized with GymMaster and your member’s portal is installed. That’s great! BUT, something’s not quite right..
Why am I not getting enough bookings for classes or personal trainers through the portal? Why haven’t I had many prospect members register their interest in my club through my website? How can I get more people to use my members portal and website? Members are unaware of the new additions and don’t check your website regularly enough to notice on their own. Your website isnt optimized for conversions. There’s no need to stress. The steps for getting your fitness club digital marketing efforts up to scratch aren’t as scary as it all sounds. And, it doesn’t require a computer whiz. Which is a relieving thing for many marketing newbies to hear. This article helps identify which problems above are hindering your club’s online performance and give ideas for remedying these issues. More users on your website means increased bookings and sign ups through the member’s portal. The first step in the process is deciding which channels we’re going to acquire these visitors through. Paid advertisements are an expensive method for attaining traffic, which can be great for short term visits. Building online presence and improving SEO is time consuming, cheap and helps secure long-term traffic. Examples of paid platforms include Facebook / Instagram Ads, Google AdWords or YouTube Ads. These channels charge you for every click which they send to your website through your ad. Clicks can cost anywhere from a few cents to a few dollars. If you’re aiming for hundreds of visitors a week you can see how it becomes expensive. Free, organic traffic for websites include traffic from search engines such as Google or referrals from your social media pages. Great ways for encouraging this include creating relevant blog content, optimising for search engines and sharing content on social media. Organic traffic takes a while to build enough to be viable to run your business on. This is because gaining rank on Google and Followers on social media takes a considerable amount of time and content. This is why many fitness clubs benefit from using a combination of both paid and organic traffic sources. For more in-depth methods for increasing traffic to your fitness club’s website, click here. These are some of the most common platforms for fitness club digital marketing campaigns. Once you’ve got a steady stream of traffic visiting your fitness club’s website, you’re going to want to ensure your website is organised to make sure you’re getting the most out of these visitors by optimising it for conversions. Optimizing for conversions essentially means you’re making sure your website isn’t confusing to first-time visitors and they can find what they’ve visited for quickly and easily. Think of your site as a sieve and your traffic as water flowing through from a tap above. 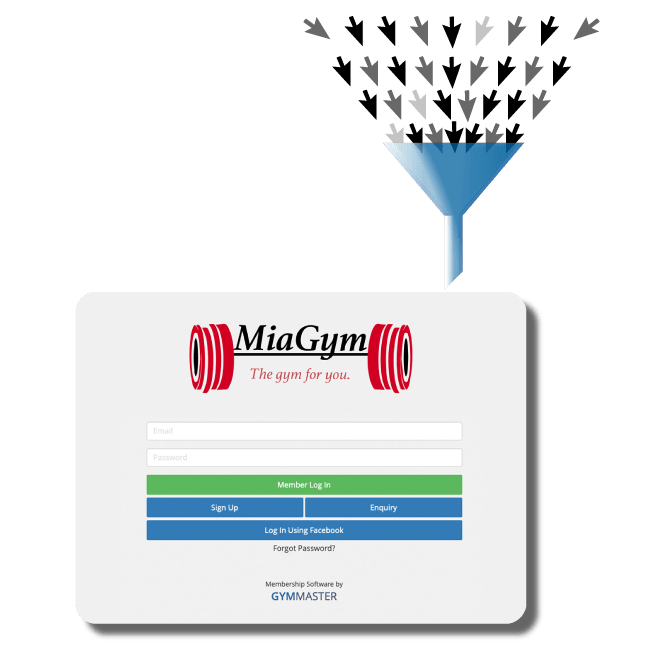 Optimizing for conversions is essentially plugging this sieve as much as possible so you’re capturing the most prospective member sign ups, class bookings or personal trainer appointments as you can. The main thing for you is ensuring your member’s portal is displayed on an uncluttered website with as little distractions as possible. It should be clearly labelled within your menu, ensuring visitors can find it quickly to avoid them bouncing off the site. Along with the ideas from this article for improving your fitness club digital marketing efforts, you can also learn some great tricks from a number of reputable sources online such as the Google Academy for Ads. If you have any questions on how GymMaster can be used side your fitness club digital marketing setup, or how to set up your members portal – please reach out and book a demo today.